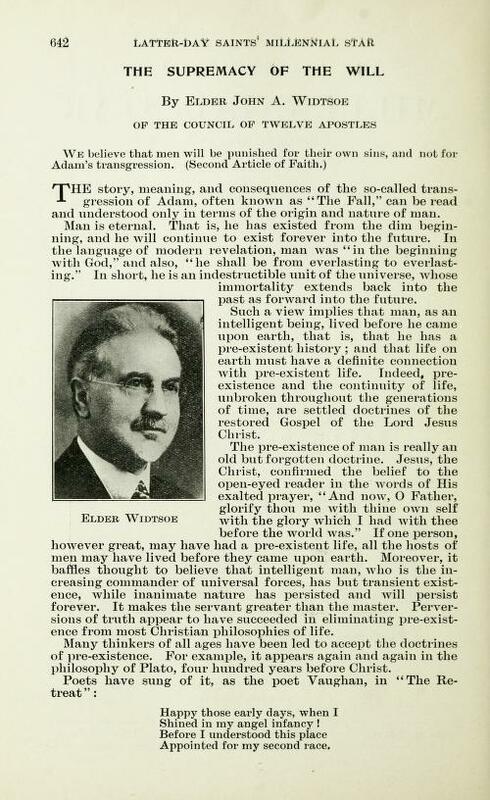 While searching the online version of the British publication of the Church of Jesus Christ of Latter-day Saints, the Millenial Star (1840-1970) for any trace of the Vaughans, I found a couple. Serendipity has its day because it was my distant cousin, Henry Vaughan the Silurist, Metaphysical Poet of the 17th Century. Apparently, LDS Apostle, John A. Widtsoe was a fan. One of the things I did right when I was a Bishop in the Church of Jesus Christ of Latter-day Saints, 20 years ago, was to have some really good talks with the combined youth of the ward. One of my favorites was to talk about the joy there is in proper intimate expression between husband and wife and in creating families. Not everyone has this opportunity due to circumstances of life - and we talked about that. We also talked about how rare it is in the world for a lot of reasons - mostly the unwillingness of males, mainly, to be responsible for sexual expression and the fact of much sexual activity outside of a godly marriage. Even in marriages supposedly done right, there is still a lot of abuse, hurt, and shame. Strangely, while all can sin, most of these are still male-caused problems. The latest furlough notice that I just acknowledged does not have a requirement of 15-minutes "excepted" work to check emails. Either that fight I had with DC and my dear supervisor (sorry) was irrelevant or it paid off. Although, it leaves me even more depressed to be cut-off, shut-out, and furloughed completely. There is an HR contact, so I think I will request retirement papers to make sure they can be processed as soon as humanly possible considering the inhumanity of indefinite furloughs with the bare hope of restored pay, someday. . . . The uninterrupted and unforeseeable absence of either a Fiscal Year 2019 (FY19) appropriation, or a continuing resolution for the Department of the Interior, Office of the Solicitor, prevents DOI from incurring further financial obligations, except for those related to performance of excepted duties, functions, and activities as defined in the Office of Management and Budget (OMB) memorandum for Heads of Executive Departments and Agencies dated November 17, 1981. Because you are not performing excepted duties during the continuing lapse in appropriations, you will remain in a nonduty and nonpay furlough status, beginning and effective at 12:00 a.m. on January 21, 2019, for a period not expected to exceed thirty (30) days. This second furlough notice will accordingly expire at 12:00 a.m. on February 20, 2019. If the length of the current lapse in appropriations for DOI has caused a new contingency to arise relevant to your work, please contact your supervisor or another excepted supervisor/employee for guidance on how to proceed. During this second furlough period, you may not work at your workplace or other alternative worksite unless and until recalled. You will not be permitted to work as an unpaid volunteer. Any paid leave (annual, sick, court, etc…) approved for use during this second furlough period is cancelled. Please continue to monitor public broadcasts and the Internet, including but not limited to DOI.gov, for information and public notices relevant to any FY19 appropriation or continuing resolution for DOI passed by Congress and signed by the President. You will be expected to return to regular duty on your next work day immediately after the end of the lapse in appropriations. 4) the 1831 Merthyr Tydfil Petition of 11,000 signatures to save the life of Dic Penderyn. Some of those 11,000 on the petition to Lord Melbourne may have joined the Church of Jesus Christ of Latter-day Saints in the 1840s. We think we know one of them. There's some irony that during the longest federal shutdown, being locked out of work, I've read The Merthyr Rising, by Gwyn A. Williams (University of Wales, Cardiff 1978). The Rising came about because of the Ironmasters conspiring to lower wages and shut-down work making it very difficult for the families of working poor in the ironworks, the coal, ironstone, and limestone mines, and processing mills to feed their families. "Bara gyda caws!" was the shout of the crowd for "bread and cheese" in front of the Castle Inn when the 93rd Highland Regiment fired on the crowd killing two dozen and wounding dozens more. It only gave the leaders of the town and small contingent of soldiers an opportunity to escape to Penydarren House, which was more easily defended. The workers held the town for a few days in June 1831. They even held off the Highlanders' relief troops from Brecon at the steep slopes of Cefn Coed just north of Merthyr Tydfil. However, within a few days, the gentry militias and soldiers of the King converged on the town and the workers went back to the mines and furnaces. The British Parliament and the ironmasters were smart enough to establish some reform. I did in the end find one 'huge white banner': it was carried by workers on the march to the Waun Fair which started the rebellion. The young boy I never found. 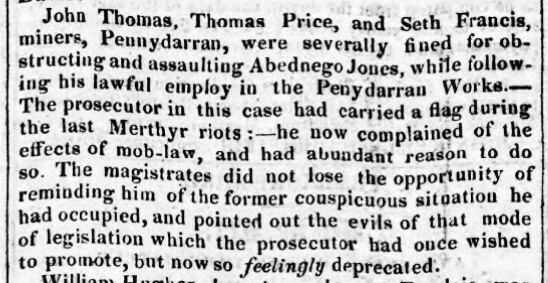 But once, quite by accident, I came across a court case in the Merthyr Guardian for 1833. A miner sued two others for cheating him out of his stall, won, and was then exposed as a man who had 'carried a banner during the Merthyr Riots'. This phrase recurs constantly in obituary and other notices; it evidently marked a man out. The judge read the offender an appropriate sermon. His name was Abednego Jones. [footnote to the same article that I found.] In 1833, he was no boy. Perhaps he was short. The Merthyr Rising, at 14. I did go into my work email today. I guess we are supposed to check now and then to make sure our litigation deadlines are met. I don't have any active litigation as I've been working my way out of that in preparation for retirement. I went into email today just to check my calendar. I had the following email which I haven't even read because to me it is a mass of confusion. I only skimmed it to delete any names or personal identifiers. If you want to just skim down to the end for my response, that's OK.
Code 105 "Government Shutdown - Furlough": Use this code for all Furloughed time, including hours not worked by an excepted or exempted employee. The FAV key for Leave and Holidays is used in conjunction with this work code. Code 107 "Government Shutdown - Excepted": Use this code for all Excepted time (unfunded work that has been authorized). The FAV key for "Administration" is used in conjunction with Code 107 when checking emails for up to 15-minutes per day. Use the normal appropriate FAV key for all other excepted work.